Habit: Plant cespitose, 20--30(40) cm; rhizome short; stolons +- 0. Leaf: flat, tip obtuse, thickened; basal leaves +- 7--14 cm, 3--4.5 mm wide, cauline 1--3, (3.5)5--9(11) cm, to +- 4.5 mm wide. Inflorescence: 1--2 clusters +- sessile, (0)1--3(6) peduncled, 0.6--1.3 mm, 0.7--1 mm wide, broadly ovoid to +- cylindric, (3)5--9(13)-flowered; lower bract 1.5--7 cm, generally < (>) inflorescence. Flower: perianth parts (3.1)3.4--4(5) mm, +- equal, lanceolate, acuminate to acute, +- dark chestnut-brown; anthers (1.1)1.5--2 mm, filaments 0.4--0.6 mm; style 0.6--1.2 mm, stigmas 2--3.5 mm. Fruit: < perianth, obovoid, pale brown, +- obtuse; valves +- 2.6--2.9 mm, 1.8--2 mm wide. Seed: 1.2--1.3 mm, 0.9--1.1 mm wide, ovoid-subspheric; appendage 0.2--0.3 mm. Chromosomes: 2n=12. Ecology: Open, drier woodland; Elevation: < 2600 m. Bioregional Distribution: NCoR, c&s SNF, SNH, CCo; Distribution Outside California: to Alaska. Flowering Time: Apr--Jul Note: Further study needed. Unabridged Note: A variable complex of populations comprising 2 morphological extremes linked by a majority of intermediates: large-flowered plants with clusters broadly ovoid, dense, and plants with medium-sized flowers in looser clusters. The 2 forms occasionally coexist at a locality. 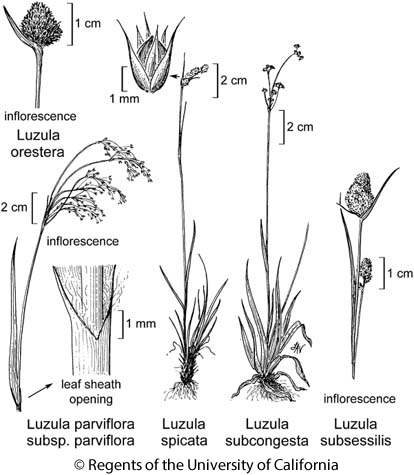 Further population and karyotype research is needed; the whole group of Luzula comosa and Luzula subsessilis is imperfectly known. Citation for this treatment: Jan Kirschner 2012, Luzula subsessilis, in Jepson Flora Project (eds.) Jepson eFlora, http://ucjeps.berkeley.edu/eflora/eflora_display.php?tid=32171, accessed on April 19, 2019. No expert verified images found for Luzula subsessilis. NCoR, c&s SNF, SNH, CCo; Markers link to CCH specimen records. Yellow markers indicate records that may provide evidence for eFlora range revision or may have georeferencing or identification issues. Purple markers indicate specimens collected from a garden, greenhouse, or other non-wild location.